I had to come up with something for my sister-in-law’s bday. 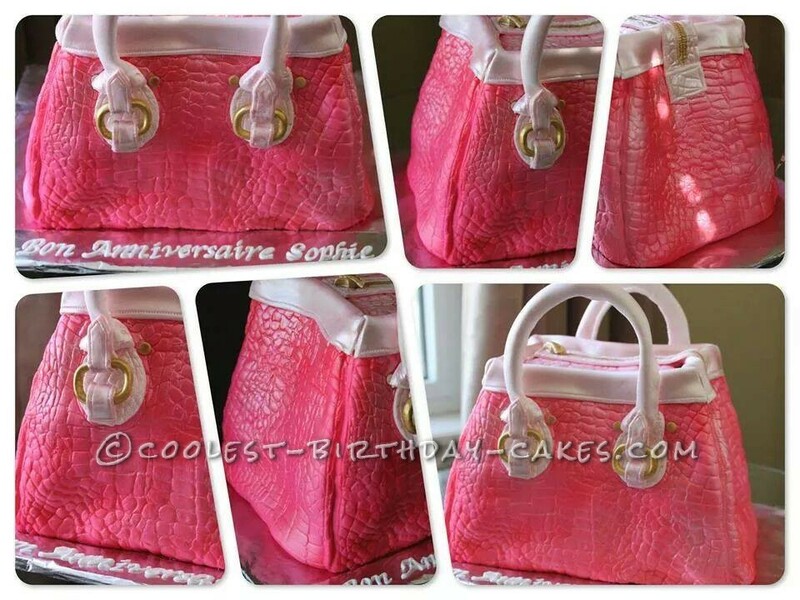 I decided to make a purse shaped cake for her in her favourite colour…pink! It was one of the craziest, most detailed cakes I’ve made, but a lot of fun! I had to start on parts of the decor early so that there was enough time for it to dry without breaking or changing shapes. Then, I baked my cakes and had to cut them into the size I wanted. I made the filling/buttercream inside and stacked the cakes to the height I wanted the purse to be. Left it in the fridge fora bit to firm up so I could sculpt the shape out. Once the cake was pieced together and sculpted, the fun part began! I first pieced together the outside leather part of the purse. It took awhile as I had to freeze the parts first in order to get it firm enough to stay up and be able to cut without changing its shape. After that was all done, I filled in the details, the buckles, the zipper, the handles (all which were made prior and drying out on the table). Once the cake came together, I airbrushed the sheen pink colour I had to give it that glossy look. If you don’t have airbrush colors, you can use any colored fondant and then brush some vodka over to give it the glossy look! Was also a gluten-free chocolate cake!!! We placed it on a table in the room at the restaurant we were having dinner and everyone just walked by it thinking it was a real purse. No one knew until it was cake cutting time. They were all surprised. Birthday cake idea Posted by Andrea N.
What size cake tin did you use for this cake? And how many did you do? I want to make one like this, but open & full of sweets for my little girl. Any do’s or don’ts?